After George receives some information from his friend Simons about a big merger involving an opera televising company, and is assured that another associate named Wilkinson will notify him of the exact right moment to sell the company’s stock, both George and Jerry decide to invest in the company’s (Sendrax) publicly traded stock. Are George and Jerry guilty of insider trading? Is Wilkinson? What about Simons? Insider trading is generally defined as trading a stock/security in “breach of a fiduciary duty or other relationship of trust and confidence, on the basis of material, nonpublic information about the security.” Meaning, company directors, or officers who know of confidential information about the company, are not allowed to trade stocks based on that knowledge because they have an obligation to put the interests of shareholders over their own. Additionally, all company employees are legally obligated to refrain from trading stocks based on confidential information about the company. This is known as the “level playing field” theory of insider trading – essentially that it would be unfair for those with special information, because they work for the company, to trade stocks with outsiders who don’t have that special advantage. “Constructive insiders,” bankers, lawyers, and others who receive confidential information from a company while providing services for that company are also barred from trading based on that information. Under this approach, “tipping” is also prohibited. This means that those in position of such confidential information cannot tip off a friend or family member about that information so that they can benefit in trading the stock. Lastly, the “misappropriation theory” of insider trading is a catch-all theory of liability. It states that anyone providing services to a company (not just “insiders”) who comes into possession of any confidential information not yet made known to the public is not allowed to trade stocks based on that information. Tippees who receive information under the misappropriation theory might also be prohibited from trading. If this all sounds confusing, that’s because it’s “all manipulated with junk bonds” and you just “can’t win.” The simplest way to think about insider trading though is that somebody who knows confidential information is not allowed to trade stocks based on that information because this would destroy public confidence in the integrity of the stock market. Let’s begin the analysis with Wilkinson. It is not entirely clear who Wilkinson is, or how he came to know about this valuable piece of televised opera information. At first, he just appears to be a stock whiz who understands how the market fluctuates; as George says “he made a fortune in the stock market. Now he’s got some new thing.” But George quickly follows that up by saying “you know, there’s supposed to be a big merger. He wasn’t even supposed to say anything.” It sounds like this information is not yet known to the public, since Wilkinson was supposed to keep it quiet. If Wilkinson knows information that the public doesn’t know yet, then he is trading stocks based on confidential information and is in violation of the law. Since Wilkinson also knows the “exact right minute to sell,” that’s also strong evidence that he has some kind of secret information. While it is not entirely clear that Wilkinson is trading based on insider information, it certainly seems like the SEC could make out a strong case that he has violated the law. Next up is Simons. Once again, not much is known about him, but it is quite clear that he is also invested in Sendrax, since he “made money” on the deal. 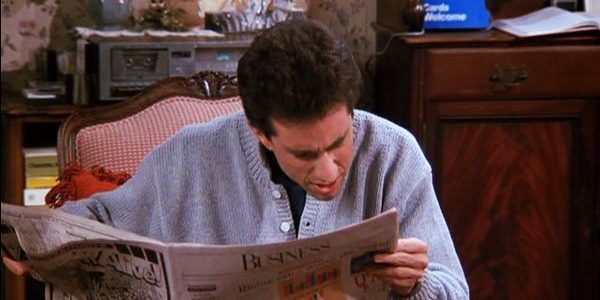 What’s also fairly clear is that he is not directly privy to the insider information, as George tells Jerry that Simons “knows this guy.” Meaning, Simons and Wilkinson have a tipper-tippee relationship. Under court precedent, once again a strong case could be made out that Simons is also in violation of the law. Jerry and George would also seem to be in a “Monet-Manet-tippy-tippy-day-day” with Simons, and could face liability for making trades based on that information. Additionally, under the court’s “misappropriation theory,” Jerry and George might still be prohibited from trading based on non-public information if the court could find that certain factors were present. Overall though, it seems unlikely that these two would face criminal or civil liability for trading on this information. Insider trading is a difficult and intricate legal topic. One of the things that makes it all the more difficult is that it is constantly expanding and becoming stricter in who could face liability. For instance, when Jerry and George got involved in Sendrax in 1990, the “misappropriation theory” had not been fully adopted by the Supreme Court, and Jerry and George might not have even faced criminal liability at that time. However, when deciding whether to take Wilkinson’s next advice and invest in that Robot Butcher, probably best for them to play it safe and invest in Kramer’s roll out tie dispenser instead. I don’t see how the misappropriation theory applies to George and Jerry. As I understand it, the misappropriation theory extends the class of “insiders” to people who are not employees of the company but who acquire non-public information by performing services for it. O’Hagan, for example, was a lawyer at the company’s firm. The printer of a prospectus is also an insider under the misappropriation theory. But George and Jerry have no relationship to the company whatever. They do not perform services for it. So I don’t see how they are insiders under the misappropriation theory. Thanks for reading the blog and taking the time to comment! To quickly answer your question, the Supreme Court has not ruled specifically on whether tippees can face liability for information acquired under the misappropriation theory. Lower courts are divided on the question. I’ve edited our post (and noted so at the bottom of the article) to clarify that George and Jerry “might” face liability instead of “would” face liability. Our wording was not quite accurate in the original post. Additionally, here is a little more on the topic. Yes, we agree with your analysis of O’Hagan and how the case itself extends liability only to those who are not employees of the company but acquire non-public information due to their relationship with the company. But some lower courts have also extended this theory to tippees (see: SEC v. Yun, 327 F.3d 1263, 1270 n. 15 (11th Cir.) (https://www.leagle.com/decision/20031590327f3d126311462), which found that trades by a third party tipppee could fall under the misappropriation theory). We think it would be incredibly unlikely that Jerry and George could face liability, especially since the facts of the episode are not quite analogous to the facts of SEC v. Yun, but it might still be possible if certain factors are present. Also, see this language from the American Bar Association (https://www.americanbar.org/content/dam/aba/administrative/litigation/materials/sac_2012/29-2_the_law_of_insider_trading.authcheckdam.pdf). I see. Thanks. It looks like the law on insider trading may be evolving in a way similar to that of product liability, where the requirement of privity was eventually eliminated. That is, rather than considering it to be insider trading only if the trader acquired the information as a result of a privileged relationship with the company, anyone who acquires information that he or she has reason to believe is not available to the general public may be considered to have engaged in insider trading, if he or she trades on it. It’s an interesting blog. Please keep up the good work. Yes, that seems to be how some courts are ruling. We certainly will! Stay tuned for another post this week.